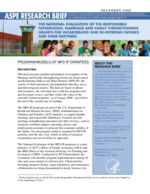 This brief describes the context in which Responsible Fatherhood, Marriage and Family Strengthening Grants for Incarcerated and Re-entering Fathers and their Partners (MFS-IP) are operating, the populations served by the programs, and the program models in use among the grantees. This brief was prepared by Tasseli McKay and Christine Lindquist of RTI International, under contract to ASPE. It describes the Responsible Fatherhood, Marriage, and Family Strengthening Grants for Incarcerated and Re-Entering Fathers and their Partners (MFS-IP) and provides an overview of the implementation and impact evaluation of this initiative.